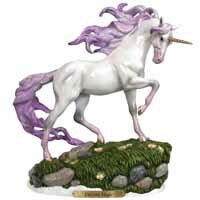 Unicorn Magic | Painted Ponies Everyday Figurines | One Price Low Flat Shipping! From the Trail of Painted Ponies Winter 2018 Collection, Unicorn Magic. Made of stone resin. Measures 9.5" tall. Designed by equine artist, Audrey Dixon. Cast in a triumphant pose, this unicorn is portrayed at the edge of a clearing, with glittery lavender mane and tail blowing in the wind, and its golden horn beaming in the sunlight. Unicorns have a reputation for roaming forests and fields, untouched and untamed, always elusive, careful to stay unseen by the human eye, except for special moments when like magic they appear to enchant anyone lucky enough to see them. *The flowers on the base light up!